Architectural style of the building. Ideally, the style of deck railing selected should complement the architectural style of the building, regardless of whether it is a commercial building or private residence. For example, a black wrought iron railing with a curlicue design goes beautifully with the tile roof and stucco construction of a Mediterranean style home while a rustic cabin is better served by a natural, hand-hewn wood deck railing system. A sleek chrome or brass railing system will augment the beauty of a contemporary glass structure while a rubbed bronze system is more suitable on a traditionally styled structure. Use of the building. A commercial building has different deck and stair railing needs than a private home. And a public building such as a hospital, library or government building has very definite railing system requirements to properly serve visitors. Every city, county and state has their own building codes so it is important to check local codes before selecting a deck railing system. Government regulations and building codes. Depending on the use of the building, the United States Government has very specific building requirements to insure the needs of all who use the building are met, including those with physical challenges. More information can be found at ADA.GOV and in the resources listed on this page. Privacy needs. A deck that faces a public walkway at the beach, for example, will offer less privacy than an upper deck overlooking a beautiful view of a lake or the mountains. A bedroom or bath in a residence or hotel will have different privacy requirements than a deck that opens onto a pool area or lobby. It is important to address these privacy concerns when choosing a deck railing system. Material. Today’s market offers many options in deck materials. Glass, wood, metal, vinyl and synthetic materials are readily available in options that will enhance any architectural style; or consider custom railing systems for a unique and personalized look. Maintenance is also a consideration when making a choice on deck railing systems. Some metals and wood will need to be painted occasionally and glass requires frequent cleaning to remove water spots from sprinklers and weather. Safety. Refer back to your local building codes and government regulations to insure proper construction and installation of your deck railing system. The railing and handrail height, space between balusters and weight restrictions are just some of the issues that need to be addressed. 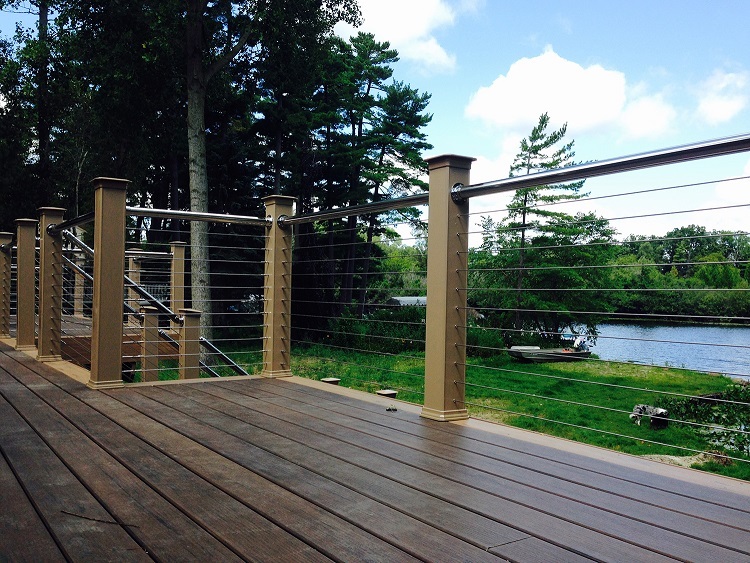 A little bit of time spent determining your deck railing needs and researching building codes will result in a beautiful and functional deck that can be enjoyed by visitors to your home or business for years to come.